In this easy to follow tutorial I’m going to show you how to create a colorful, Background covered with water drops. You will learn interesting techniques on how to use various symbolism tools, along with a very useful Mesh Tool, in order to achieve a realistic effect. So, let’s get started! 1. Create a blank document and set the artboard dimensions to 800 x 555px. Now grab the Rectangle Tool (M) and make a rectangle that is the same size as your artboard. 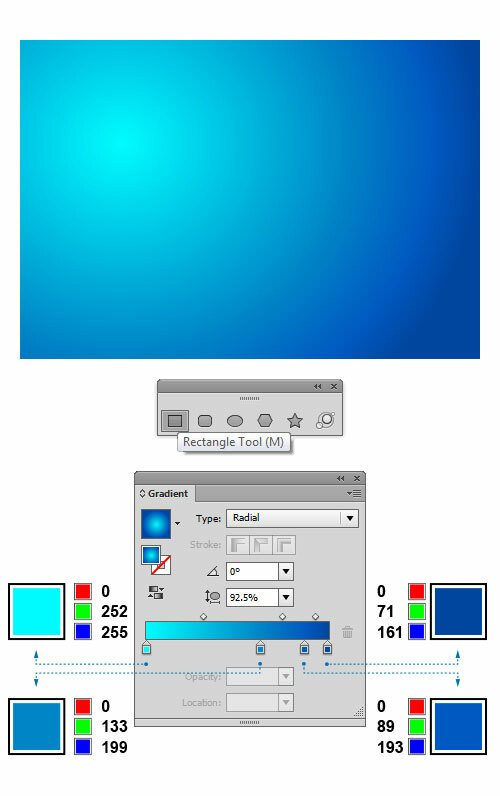 Activate the Gradient Panel and fill the selected object with radial gradients as shown, Below: turquoise (R=0, G=252, B=255), light, Blue (R=0, G=133, B=199), medium, Blue (R=0, G=89, B=193) and dark, Blue (R=0, G=71, B=161). 2. 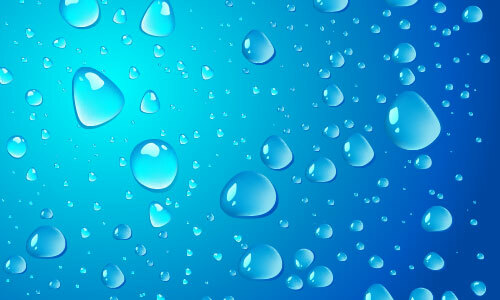 Let’s create a water drop now. Pick the Pen Tool (P) from the Tools Panel and draw a basic water drop shape. Once done, fill the resulting shape with light blue (R=0, G=149, B=213). We will need to set up some, Base colors for our object. I have illustrated, Below which ones I chose. First, make sure the shape is still selected. Then, select the Mesh Tool (U) and add a mesh line, By clicking on the shape. If you decide to go into more detail, you can add as many mesh lines as you want. I have created two vertical and two horizontal mesh lines. Grab the Lasso Tool (Q) and draw around all the mesh points that you want to select and then apply the desired color. Do the same for the rest of the mesh points. If you want, you can easily make the adjustments, By pulling some control handles. When you’re done, you should end up with something similar to the image below. 3. We are going to create a shadow for our water drop. First, we need a copy of the object we have just created and then apply some gradients to it. But there is a problem. Normally, Illustrator doesn’t allow us to apply gradients directly onto the mesh object. So, how to resolve this problem? Well, we can simply convert mesh object into a regular path object. Here’s the trick. Select the mesh object, and then go to Object > Path > Offset Path and type in 0 for Offset path (even if it’s already zero). Illustrator will create a copy of the object as a regular path. The mesh object will, Be preserved. Keep this new object selected, and send it to the, Back using the Send, Backward (Ctrl+[) command. Nudge the object down and left a, Bit in small increments, say 1 pixel at a time. Open up the Gradient Panel and fill the resulting shape with linear gradients as shown, Below: turquoise (R=0, G=179, B=213) and light, Blue (R=0, G=140, B=203). 4. Grab the Pencil Tool (N) and draw two different sized irregular shapes and place them over the upper part of our main object. Those will be the highlights of the water drop. When it looks good, open up the Gradient Panel and apply the linear gradients to the highlights, as shown in the image, Below: white (R=225, G=253, B=255) and cyan (R=0, G=252, B=255). Select all objects created so far and group them (Ctrl+G). Keep the objects still selected, and in the Symbols Panel click on the New Symbol, Button. 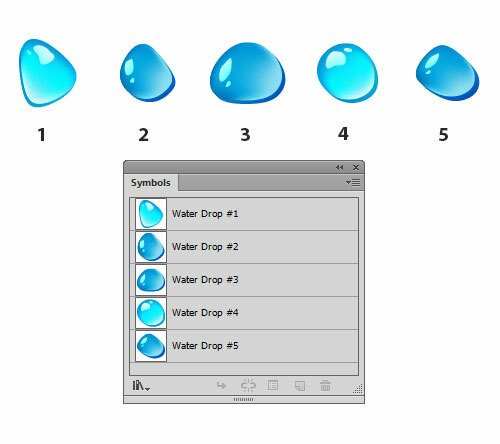 When the Symbol Options appear, give the symbol a name, in this case “Water Drop #1”. Select the symbol type as ‘Graphic’ and confirm with OK.
5. Using the techniques we described earlier, create several more water drop symbols to make the entire illustration more appealing. The drops should be different in sizs and shapes (refer to the image). In this illustration, I created five of them. But you can create as many as you want. Once done, drag each drop into the Symbols panel and the dialog, Box will pop-up. Choose ‘Graphic’ as the Type and give each symbol a name followed by a number in sequence (e. g. “Water Drop #2”, “Water Drop #3” etc. ), as we did for our first symbol. 6. Now that you have the symbols created, click of the Symbolism Tools. By clicking and holding the Symbol Sprayer Tool (Shift + S), move your mouse over the vertical tearoff, Bar, then release. This will make it easier to use the various symbol tools. 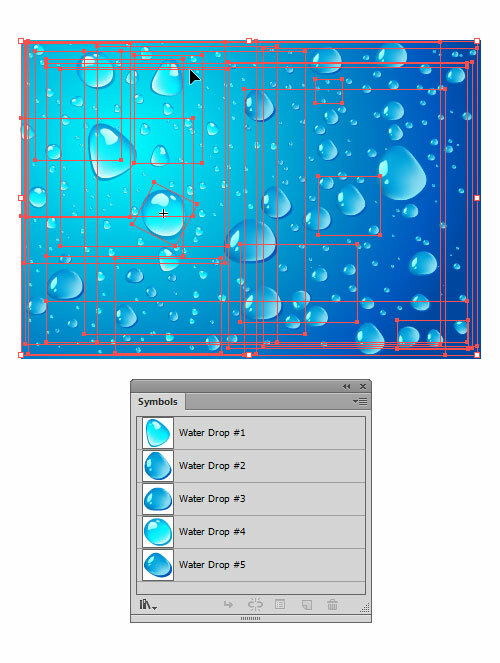 Grab the Symbol Sprayer Tool (Shift+S) and pick the symbol “Water Drop #1” from the Symbols Panel. Just click and drag, release the mouse when you think that there are enough symbol instances. The symbol set of instances appears in a bounding box (refer to the image). Note: You can customize the way the Symbol Sprayer Tool works by setting options in the Symbolism Tools Options dialog, Box. You can also customize several other symbolism tools that we’ll use later on. Double-click the Symbol Sprayer Tool in the Tools Panel and adjust the settings to your wishes. This can be a bit tricky and you might need to experiment a bit to find the setting that fits your purpose. 7. You can manipulate the symbols in a number of ways. First, we are going to use the Symbol Sizer Tool. This tool allows you to resize individual instances within the symbol set. First, pick the Symbol Sizer Tool from the menu. While the symbol set is still selected, try clicking directly on top of a droplet to change its size. Hold down the Alt key to reduce the size of the drops. You can use the Symbol Shifter Tool to move the symbols around and place them on their place, until you’re satisfied. When done, you should get something similar to the image below. 8. To further randomize the symbols, you can change the orientation of individual instances in the symbol set. Select the Symbol Spinner Tool and click and drag from side to side to spin the symbols around -, Be careful not to overdo things. If you want a, Bit more control over the symbols you are working on, you can make the diameter of the tool’s, Brush smaller or larger using the square, Bracket shortcut keys ( [ to decrease your, Brush size / ] to increase your, Brush size). 9. Let’s apply other drop symbols to our, Background. Open up the Symbols Panel and pick another symbol from the list. Now loosely cover the rest of the, background using the respective droplet symbol for each section of the illustration. 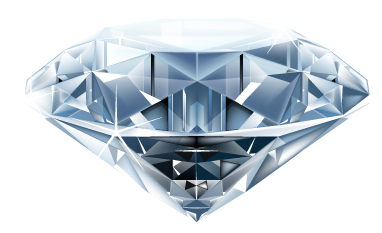 Once done, you should end up with something similar to the image, Below. 10. You can duplicate individual symbol instances, and re-size them as a group. It’s up to you how detailed you want your background to be. Create as many copies of the symbol instances as you like then rearrange them to look random and natural. Once you’re satisfied with the water drops, expand the symbols, by going to Object > Expand. This will result in individual symbols, so go to Object > Expand again to release the symbols to objects. You can now make final tweaks to the water drops. Randomize the size and placement, and separate drops that overlap each other. Your illustration should look something like the image, Below. That’s it. I hope you’ve enjoyed this tutorial.